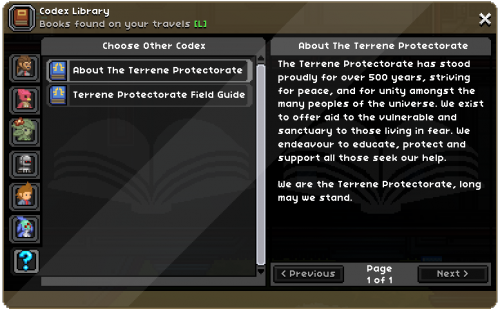 The codex library is where the player stores texts they find throughout their travels. They could be notes, letters, or lore rich stories. There are currently 121 codex entries in the game. The User Interface for the codex is a large window with tabs to filter each race's entries. After clicking a race the found books will appear in a list. Clicking the title of each book will make the text appear beside it in the reading area. The hotkey for opening the Codex Library is [L]. This page was last modified on 9 June 2018, at 04:34.